Hinsdale,NY—Lila G. Cooper of 3819 Main St. died Monday (March 24, 2008) in the Pines Healthcare and Rehabilitation Center in Machias after a short illness. Born October 26, 1911 in Hinsdale, NY she was the daughter of Frederick C. and Zetta Edwards Grambow. On June 29, 1938 in Cuba, NY she married Charles M. Cooper who died June 13, 1975. Mrs. Cooper was a 1928 graduate of Hinsdale Union School and of the Olean Teachers’ Training Class of 1929. She was also a 1935 graduate of Geneseo Normal School and then received her Bachelors of Science degree at SUNY Geneseo in 1958. She started teaching in a one-room school on Dutch Hill in 1929 and became a teacher at Hinsdale Central School in 1934. After her marriage she taught for 2½ years (1941-43) at Daggett Hollow School near Obi. She returned to Hinsdale Central School in 1943, continuing there until her retirement in June 1972 after 40 ½ years of teaching. In 1970 she was listed in “Outstanding Teachers of America.” She had been a member of the NYS Retired Teachers Association for many years and was also Historian of the Hinsdale Alumni Association. She had been a member of the Hinsdale United Methodist Church since 1932 and had served as a trustee and treasurer. She formerly taught Sunday school for 40 years and was a member of the United Methodist Women. She had been a 50 year member of Hinsdale Rebekah Lodge #549 and the Past Noble Grand’s Club of Cattaraugus County, was Past District Deputy President of Cattaraugus Rebekah District #1 and was currently a member of Allegany Rebekah Lodge #407 having received her 75 year jewel from them in 2004. She had been a Past Matron of McKee Chapter #212, Order of the astern Star in Cuba, NY. She was a charter member and past president of Alpha Sigma Chapter of Delta Kappa Gamma International, and was a member and past regent of Olean Chapter, National Society Daughters of the American Revolution. She was currently serving as treasurer of the Hinsdale Cemetery Association, a position she had held since 1945. After her retirement from teaching, she taught quilt making at the YMCA, BOCES and Olean Night School. She was a member of the Southern Tier Quilt Guild, the Olean General Hospital Auxiliary and she had been a volunteer in the RSVP program since 1977. Her other interests included genealogy and local history where in 2006 she was awarded a Certification as Registered Historian from the Association of Public Historians of New York State. 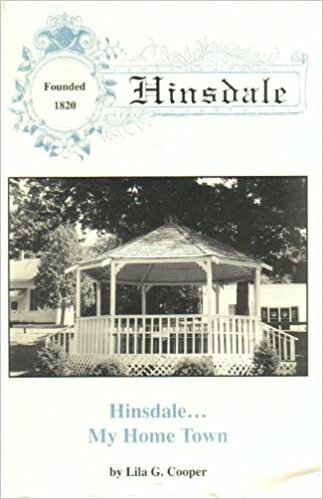 She had published many newspaper and magazine articles and wrote a book “Hinsdale, My Home Town”. She had been the Hinsdale Town Historian since 1971 and was a member of the Hinsdale Historical Association and the Cattaraugus County Historical Association. She enjoyed doll collecting and was a member of the SWNY-Penn Doll Club. She was a member of the Hinsdale Guys and Gals and the Busyette Craft Club. Other interests included reading, Bible Study, crossword puzzles and crypto- quotes, crocheting, needlework and especially her family. She traveled extensively, visiting all states except Alaska, as well as Canada, Mexico, Europe, Egypt and Israel. Surviving are 5 nephews, one of whom, David A. (Elaine) Brown of Webster, NY came to live with Mr. and Mrs. Cooper in 1951. Their 3 children are Mark A. (Mary Jo) Brown of Latham, NY and their 2 sons Andrew and Gregory, David S. Brown of Buffalo and Christopher (Kara) Brown of Chicago, IL; 4 other nephews Robert J. Brown of Emporium, PA, Floyd L. (Roberta) Brown of Cuyahoga Falls, OH, Walter F. (Margaret) Grambow of Commack, NY and Dr. Richard C. (Barbara) Grambow of Loveland, OH; 1 niece-in-law Ploma Raub of West Henrietta, NY; 25 great nieces and nephews and 39 great-great nieces and nephews. Family members who predeceased her in addition to her husband and parents include 2 sisters Nina Raub and her husband Herman of Hinsdale and Gertrude Brown and her husband Floyd of Emporium, PA; 2 brothers Frederick J. Grambow and his wife Isabelle of Port Charlotte, FL and Chandler Grambow and his wife Olive of Hinsdale; 2 nephews Gerald Raub and his wife Ruth of Allegany and Donald Raub of West Henrietta, NY; 2 nieces Rosamond Raub Daniels and her husband Jerry of Port Allegany, PA. and Betty Brown Hollingsworth and her husband Harry of Akron, OH; a niece-in-law Barbara Moscato Brown of Emporium, PA; a great niece Sandra Raub Mitchell of Alpena, MI and a great great nephew Lee Castillo of Waterville, Maine. Friends will be received at the Casey, Halwig & Hartle Funeral Home 3128 W. State Rd. Olean Wednesday from 7-9pm and Thursday from 2-4 & 7-9pm. Funeral and committal services will be held Friday (March 28, 2008) at 11:00am at the Hinsdale United Methodist Church. Interim pastor Darlene L. Smiley will officiate. Burial will be in Hinsdale Cemetery. Members of the Allegany Rebekah Lodge #407 will hold a memorial service Thursday at 7:30pm in the funeral home. Memorials may be directed to the Hinsdale United Methodist Church or to the Hinsdale Central School Alumni Scholarship Fund c/o Diana Dutton, Hinsdale, NY 14743.